Asleep for a hundred years, awoken by a kiss, Aurora’s life was supposed to be a fairytale. But since discovering that loyalty to the crown and loyalty to her country are two very different things, Aurora knows she can only dream of happily ever after. Once the enchanted princess, savior of her people, she is now branded a traitor. As Aurora and Finnegan work together to harness her power—something so fiery and dangerous that is as likely to destroy those close to Aurora as it is to save them—she begins to unravel the mysteries surrounding the curse that was placed on her over a century before…and uncover the truth about the destiny she was always meant to fulfill. Brimming with captivating fantasy and life-threatening danger, the sequel to A Wicked Thing takes Sleeping Beauty on an adventure unlike any she’s ever had before. The first book in the series, A Wicked Thing, was not a bad book at all; It had a great concept. But there were several issues that I had with the story as a whole. That didn't stop me from wanting to read this sequel, though. Thank goodness for that, because Rhiannon's writing has grown exponentially in round two of this series! We start off about a week after the events of A Wicked Thing, with Aurora on the run from King Henry's men. She is starving and weary from traveling so long, and goes into a bread shop to buy some bread. But the king's men show up and while escaping, her magic goes crazy and she ends up burning a village down. She is hiding in the forest on the outskirts of the town, horrified and scared, when Nettle appears out of nowhere. Aurora doesn't know if she can trust her, but she decides to follow her anyway. That is how she finds herself in Finnegan's kingdom. Like I said earlier, book one didn't work for me for a few different reasons. One was the slow pacing, but the most important was the lack of character development. In this sequel, Rhiannon Thomas has changed all of that. Aurora and Finnegan both show a great amount of growth in this story. All of the secondary characters have back stories and personalities that are distinguishable and well done. The pacing has sped up a ton, though still a bit slow in places. And one of the biggest things is the world-building. Alyssinia is so much more alive in this book, and I loved all of the ins and outs of Finnegan's kingdom. I love the appearance of old characters peppered throughout the story, and all of them have grown so much as well. The new characters are bright spots in the book. 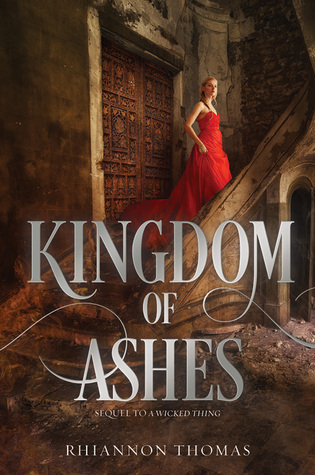 I really enjoyed Kingdom of the Ashes. It still has it's flaws, mostly in the slow pacing of the story, but all in all this author has hit the ball out of the park with this sequel. I am genuinely looking forward to the next book in this series, and really hoping for MORE DRAGONS!! !